For the things in life that matter . 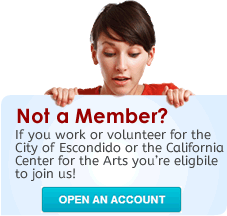 . .
Escondido Federal Credit Union provides savings and loan products to help achieve your goals throughout life. When you become a shareholder-member at EFCU, you instantly become eligible for all the benefits the Credit Union has to offer. Unlike banks, our profits are returned to members in the form of lower fees, higher dividends and lower loan rates—something the big banks just cannot offer. Excellent service is the hallmark of an excellent credit union. At Escondido Federal Credit Union, you'll find excellent service as well as low fees, low loan rates, and high dividend rates. We are dedicated to serving our members through prompt and friendly service. Escondido Federal Credit Union is dedicated to providing competitive, quality financial products and services in a superior professional and caring way, while maintaining financial strength and security. Escondido Federal Credit Union (EFCU) is committed to providing the highest quality customer service possible. Management understands that an important part of customer service is trust and confidentiality of member's account information. In accordance with Part 716 of the NCUA Rules and Regulations, EFCU has developed a non opt out policy regarding member non-public personal information. This means that member information will not be given to third party vendors, except for those with whom EFCU contracts with in order to process member requested transactions and services. Restricts access to non-public personal member information to employees who have specific business purposes in utilizing this information. Teller identification and audit information is maintained on non-public member information maintenance programs. Management staff monitors changes or maintenance to member non-public information for accuracy and integrity. Management will obtain privacy contracts from third party entities that assist in the processing of non-public member information and transactions. Staff is continually trained on the importance of maintaining confidentiality and member privacy. Staff is instructed to request identification, either verbal or physical, from members prior to releasing information or completing a transaction. Members using electronic methods to transact business on their account will be required to have a card and or pin prior to completion of the transaction. Members will be informed annually of the information collected by the credit union, how the credit union protects their information, and the methods members can use to help protect their privacy. New members will be provided a copy of the policy in their new member packet. Copies of the policy will be available at member's request.